Mark Fields: "We expect our results will grow progressively stronger." WILMINGTON, Del. 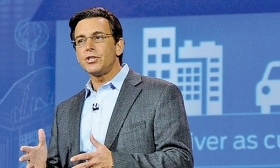 (Bloomberg) -- Ford Motor Co. CEO Mark Fields, presiding over his first annual meeting, addressed shareholder concern about the company’s lagging stock by promising the company is poised for a profit liftoff in the year’s second half. Fields is working to restore the earnings growth Ford experienced under his predecessor, Alan Mulally, who retired last year after engineering a turnaround of the automaker. Fields has said pretax profit will grow as much as 51 percent this year as the new aluminum-bodied F-150 truck reaches full production. Net income fell 56 percent last year to $3.19 billion as Ford introduced a record 24 new models, and turmoil in Russia and South America contributed to wider international losses. Since Fields, 54, become CEO last July 1, Ford shares have fallen 11 percent through Wednesday. So far this year, Ford declined 0.6 percent, closing at $15.41 Wednesday, while the Standard & Poor’s 500 rose 1.9 percent. Ford shares today fell 14 cents, or nearly 1 percent, to close at $15.27. During the meeting, two shareholders noted Ford’s stock has lagged behind the S&P 500 for the last one, two, five and 10 years. After initial buyers of the F-150 snapped up fully loaded models in the first quarter, Fields last month raised his operating profit margin forecast for Ford’s North American unit to 8.5 percent to 9.5 percent. He has said the company will post pretax income this year of $8.5 billion to $9.5 billion. The F-series, including larger versions such as the F-250, accounts for 90 percent of the company’s global automotive profit, according to Morgan Stanley. F-Series sales in the U.S. rose 1.4 percent in the first four months of 2015 after falling 1.3 percent last year. The truck was the nation’s top-selling vehicle for the 33rd straight year in 2014. The new F-150’s fuel economy increased as much as 29 percent, primarily because the aluminum body trimmed the pickup’s weight by about 700 pounds. Ford lost output of more than 100,000 trucks since the start of last year while it retooled two factories that make the model. A plant near Kansas City, Mo., began building the aluminum-bodied F-150 in March. Political and economic upheaval in Russia and South America hurt the company’s performance in the first year under Fields, a 26-year company veteran who had been COO and head of North American operations before becoming CEO. Fields received compensation of $18.6 million last year, up 82 percent from 2013 when he was COO. At Ford’s meeting Thursday, shareholders rejected a proposal to strip the founding family of its 40 percent voting control of the company and move to one vote per share. The vote was 63.7 percent against and 36.3 percent in favor. That’s the most support such a proposal has ever received, up from 34.4 percent last year. The family controls the automaker through Class B shares that only its members can own. Henry Ford’s great-grandsons, Bill Ford and his cousin Edsel Ford II are members of the board of directors.